Canadian fans of Microgaming brands know that there are tons of different options out there when it comes to slots. 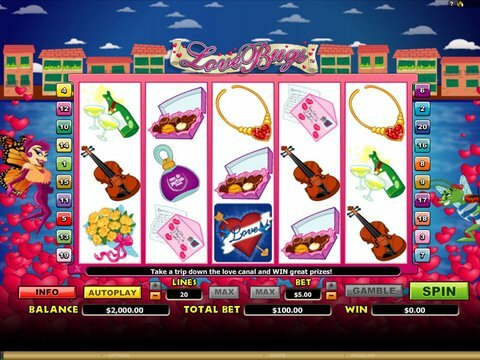 The Love Bugs slot machine isn't about the VW Beetle, though - it's about romantic bugs! Review it right here on this page with the no download, no registration Love Bugs free play slot demo that you can access from your computer or your mobile phone. This way, no matter where you are, you can pass the time with a smile on your face. Bets start out at a penny and climb to $250, and you can win up to $50,000 along the way. Icons include love notes, perfume, violins, champagne, and other things that symbolize love and romance. Both of the bugs are wild, and they can substitute for anything other than the scatter. When you get the Lady on reel one and the Love Bug on reel five, you'll get a bonus game in which you catch items that are worth different things. One of these things is 15 free spins! The Heart is the scatter and it will provide you with a payout of at least equal to your bet whenever two or more appear, but five will give you 100x, so they can be very helpful. If lovey-dovey isn't your style but you still enjoy a bit of romance, then the Immortal Romance slot, also found in Microgaming sites might be a better option. It gives you the story of four vampires who are all caught up in a love triangle, and the free spins rounds are fun. Each character is associated with a different number of free spins with a different value multiplier, and there are even multipliers that appear in the reels from time to time to help you win more. You'll really like it if you're a fan of Dracula or even Twilight.